These free story worksheets with colourful illustrations are perfect for encouraging children to create their stories and write them down. It is a brilliant way to help children develop expression in their writing and check their spelling, punctuation and grammar! 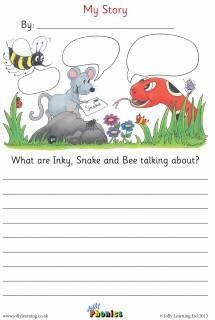 To download Inky, Snake and Bee story sheet, please click here. To download Moat Farm story sheet, please click here.